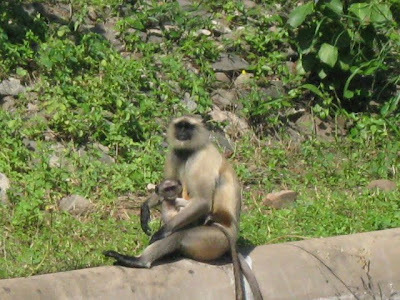 Travelling in an area which has some interesting wildlife sanctuaries, it was one of my greatest regrets that we couldn’t visit a single one on this trip, since it was primarily a pilgrimage to the two Jyotirlingams. 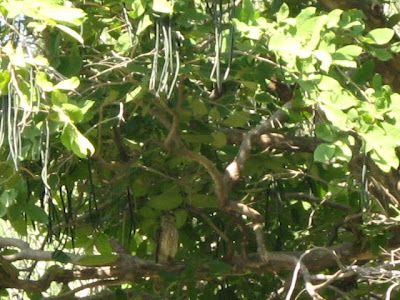 However, we are now constantly on the lookout for birds, and make all efforts to photograph as many as possible. 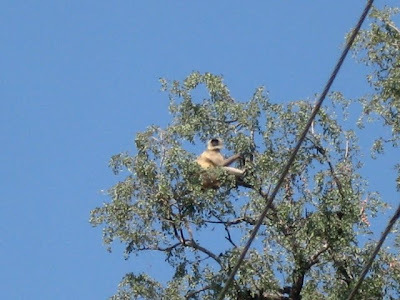 The only wild animals we saw on this trip were monkeys and snakes. 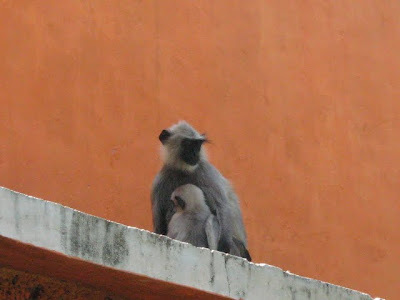 While we weren’t able to capture the snake on camera, the monkeys posed obligingly, especially at the Sandipani Ashram, Ujjain. Passing along the roads of Ujjain as we visited one temple after another, we passed pools of water which had collected due to the recent and unexpected rains. 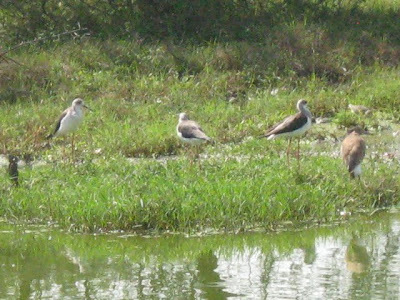 At every single pool were at least a few egrets and cattle egrets. At first, Samhith was so excited, he kept piping up “Amma look, another egret!! 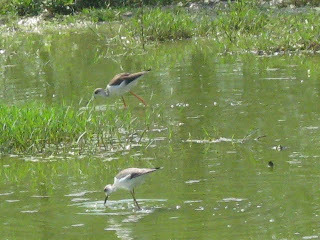 !”, but soon he got bored once he realized that there were egrets all over the place. 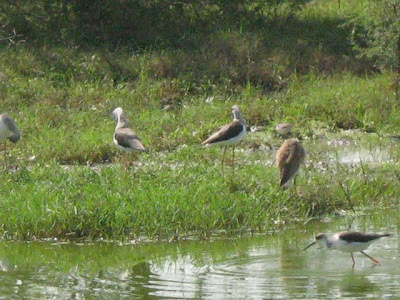 And then, as we passed one more pool, I suddenly realized that the birds there weren’t egrets! We stopped and turned back to the pool where I got down to take pics. 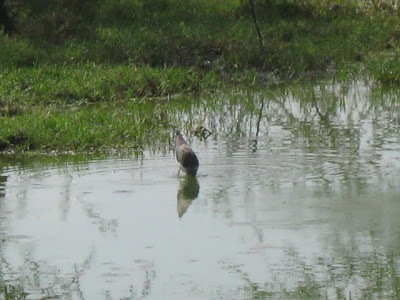 The only bird I recognized there was the pond heron (it is seen only in the last pic). I have no idea about the other birds. Can someone help me out, please? 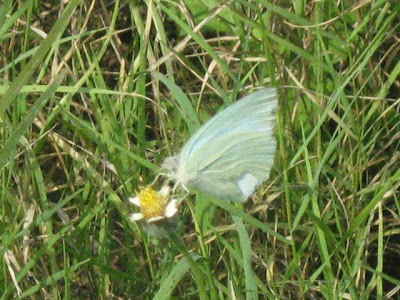 Our next encounter was at the Observatory at Ujjain where we saw plenty of butterflies, all blue in colour! We saw drongoes everywhere, both, black drongoes as well as racket-tails, but this was the only one I managed to capture…. 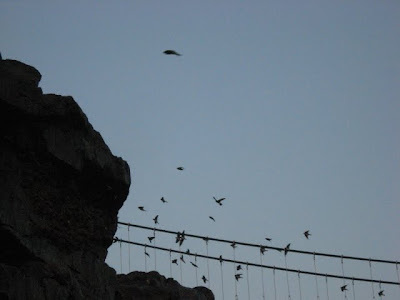 These look like nests of the swifts… and maybe there were swiftlets inside…. Were the birds bringing food to their young?? 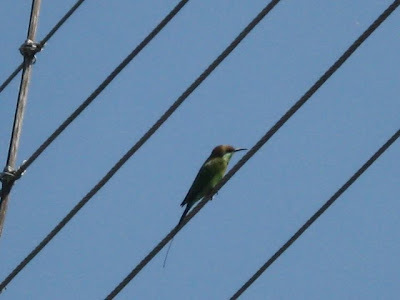 Can anyone help in identifying this one???? 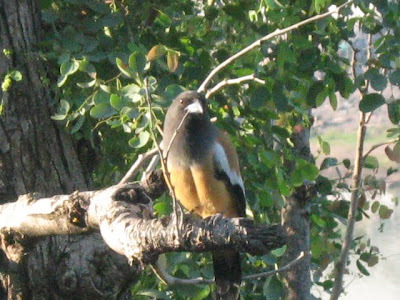 The common myna, on an uncommon perch! and below it there is a coppersmith! 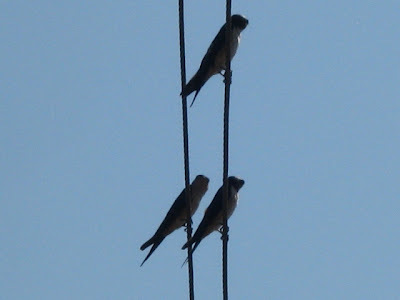 Again, I have no idea which birds these are? can anyone help me out? 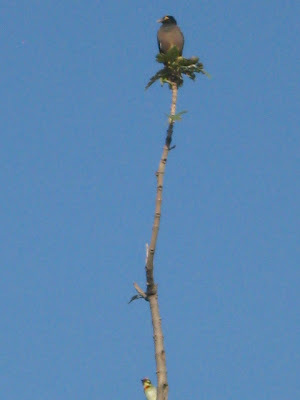 Here is a bird I saw on a tree in the distance... 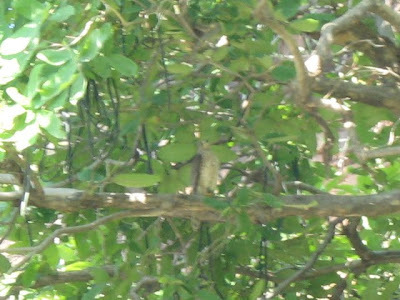 Given my camera's capacity, this is the best I could do..... Both pics are of the same bird. Can anyone take a guess as to which one this is??? 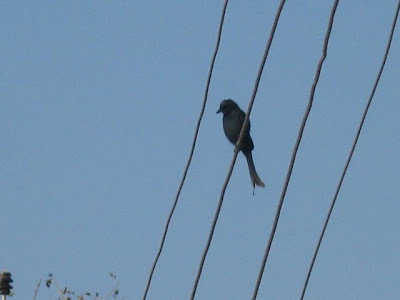 Indore was the only place we did not see any interesting birds…. After all, it is also a commercial city like Bombay, and we did not expect to see any, either. But wait, just this week, we saw something interesting from within the confines of our home, but that deserves another post, so wait till then to read about it! 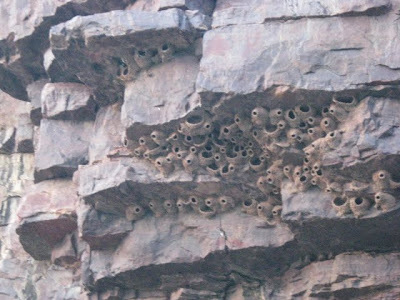 Swifts' nests are interesting. I've never seen these. I think the unnamed single bird is a type of pigeon. Can't identify the exact name. 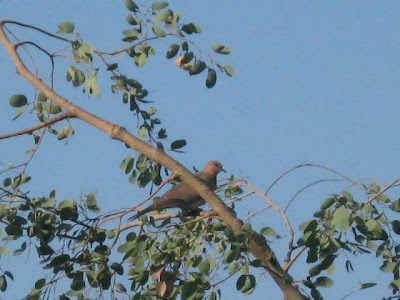 i guess the first unnamed bird is a 'spotted dove' - a type of pigeon as B mentioned. Isnt the second flock of birds, rose ringed parakeet? no idea abt the 3rd one. but, how big was it? 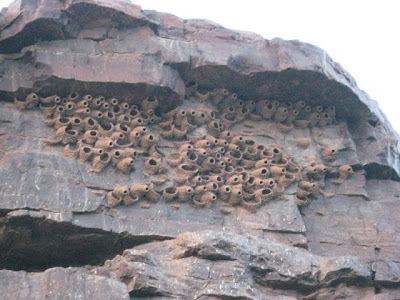 Nests are really peculiar and first of its kind that i have seen. @ Sri : the butterflies were beautiful! 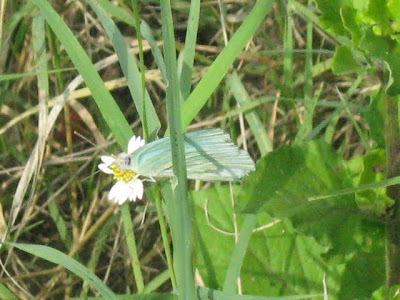 I felt so sorry that I could not capture the sight of so many butterflies on one plant!!! 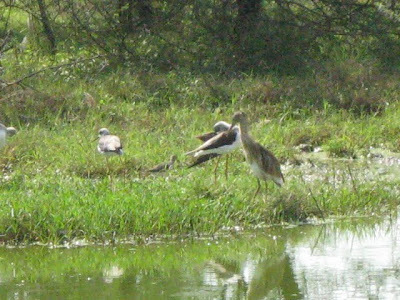 and I really wished the birds would pose for me! it was so difficult to photogrph them! 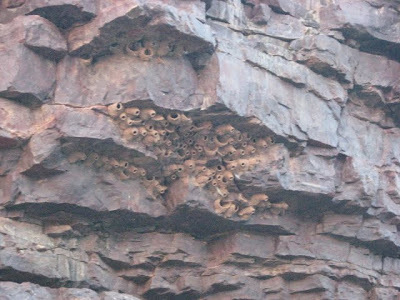 @ Bindhu : Yes, this was the first time I saw these nests.. and the only reason I could identify them was that I recently read a blog about swifts building nests on limestone cliffs!!!!! WOW, your passion for wildlife is awesome Anu. I can't image what you would do if you had the right camera gear. I m sure you would go berserk. yes it would have been a real hard work, I guess thats why the shots are good :) bravo!! What a wonderful post, and I am just flattened by those bird nests. @ Sri. thanks so much! these days, i keep looking for photo ops for the blog... am wondering if i use the camera too much.. what say u??? @ Bhavesh : thanks... yes, i was too.... and took so many pix.. these were the only ones that came out welll!! How exciting to see a variety in the wild like this. Did you go to Mandu as well?